Precision Ground Tooth, hardened razor sharp teeth for maximum penetration! Hook style tooth provides excellent chip evacuation and uniform tooth set to cut faster with precision yielding a superior surface finish.  Recipient of a Woodworkers Journal Readers’ Choice Award in 2015  Band saw blades for professional users.  Unique carbon-rich steel  optimum balance between strength and flexibility  Superior hardened and tempered material  stronger, faster cutting blade performance  Computer-controlled raker tooth setting  straighter, precise cuts with less waste. Hook Tooth for thick wood, plastic, plywood, and composition material with a more aggressive feed. Perfect for re-sawing. Sizes: 1/4″ x .025 x 6 Hook, 3/8″ x .025 x 4 Hook, 1/2″ x .025 x 3 Hook, 5/8″ x 025 x 3 Hook, 3/4″ x .032 x 3 Hook, 1″ x .035 x 2 Hook Regular Tooth (standard) Usually fine, equally spaced teeth in narrow bands for wood, plastic and nonferrous metals. 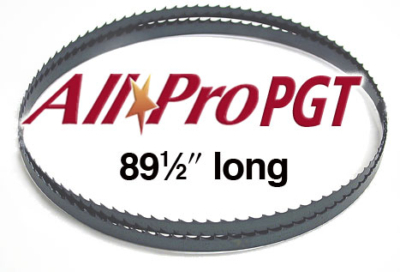 Sizes: 1/8″ x .025 x 14 Regular, 3/16″ x .025 x 10 Regular PRICES VARY, WIDER WIDTHS COST SLIGHTLY MORE. Olson’s Band and Scroll Saw Blade Catalog(2MB). 70-1/2in. long and .025in. thick. Fits 10-in. Rikon 10-305 and Sears Craftsman 21400. Check your owners manual for correct length. Select width and tooth styles from the drop-down menu – additional costs shown for wider widths. 71-3/4in. long and .025in. thick. These blades fit 10in. Delta 28-140 and 11in. Shopsmith band saws. Wider widths may cost slightly more. Chart has recommended blade widths. 72-1/2″ long and .025″ thick these blades fit 10″ Delta 28-195 & BS150LS, 10″ Skil HD3640, and 10″ Dremel 1120. Select width and tooth styles from the drop-down menu – additional cost shown for wider width. Chart has blade recommendations. 80in. long and .025in. thick. Fits all Sears Craftsman 12in. Tilting Table or Tilting Head Band Saws except Models 22412 (91in. blade) & 22400 (89-1/2in. blade). Chart has blade recommendations. 82in. long and .025in. thick. Fits 12in. Delta 28-190 and 12in. Jet. Chart has blade recommendations. 89-1/2in. long and .025in. thick. Fits 12in. Craftsman 22400. Select from drop-down menu, wider width cost slightly more. Chart has blade recommendations. 93-1/2in. long and .025in. thick. Fits most 14in. Delta /Rockwell, Jet, Rikon, Sears Craftsman, Steel City 50100, Reliant, Enlon, Star, Bridgewood, Woodtek, General, etc. Check your owners manual for correct length. Select width and tooth styles from the drop-down menu – additional costs shown for wider widths. Click yellow chart at left for blade recommendations. 93-1/2in. long and .025in. thick. 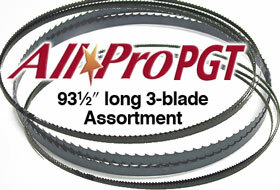 3-blade assortment includes 3/16in., 1/4in. & 5/8in. widths. Fits most 14in. Delta / Rockwell, Jet, Rikon, Sears Craftsman, Steel City 50100, Reliant, Enlon, Star, Bridgewood, Woodtek, General, etc. Check your owners manual for correct length. Chart has blade recommendations. 99-3/4in. long and most are .025in. thick. _3/4in. wide blades are .032in. Thick. Fits 14in. Craftsman 22401. Wider widths may cost slightly more – check drop-down chart for widths. 105in. long and most are .025in. thick. 3/4in. wide blades are .032in. thick. Fits most 14in. band saws (Delta/ Rockwell, Jet, Rikon, Sears Craftsman, Reliant, Enlon, Star, Bridgewood, Woodtek, General, etc.) with Riser Block Extension. Wider widths may cost more – check drop-down menu for widths and specs. Chart has blade recommendations. 111in. long. Fits 10-325 Rikon 14in. Deluxe band saw. Select width and tooth styles from the drop-down menu – additional costs shown for wider widths. Chart has blade recommendations. 115in. long and most are .025in. thick. 3/4in. wide blades are .032in. thick. Cost of blades vary by width. Fits Laguna MBAND 1412-175 14″ x 12″ band saw. Chart has recommended blade widths. 123in. long. Fits 16in. Jet band saw. Chart has blade recommendations. 125in. long. Fits 50200 Steel City 16in. band saw and the Laguna LT14 SUV band saw. Check drop-down menu for widths and specs – wider widths are priced higher. Chart has blade recommendations. 133in. long. Fits original Jet 18in. band saw. Check drop-down menu for widths and specs – wider widths are priced higher. Chart has blade recommendations. 136-1/2in. long. Fits 18in. Delta, new version Jet (18X), and Steel City 50250 band saws. Check drop-down menu for widths and specs -wider widths are priced higher. Chart has recommended blade widths.